If picking up and maintaining new good habits were easy, those habits would already be in our lives. Sometimes it’s really hard to reprogram our auto-pilot systems and replace them with new habits. Willpower alone doesn’t always work, so if you’re scared you’d return to old habits, below are a few tips to consider. 1) Use ‘Loss aversion’ to your advantage. Loss aversion theory suggests that the pain of losing a dollar is more than the pleasure of acquiring one. So let’s say, you make a promise that every time you return to your bad habit, you’re going to give out a dollar. For some people, that might be enough to make them stop. While the idea is appealing, if the dollar is given away for a good cause, it is easy to mentally ‘win’ in both situations. If you don’t return to your habit, you don’t lose the dollar. If you do return to your old habit, you give the dollar away to charity (which is not so bad). That would render this method useless in controlling your habits. Some popular authors, like Chris Bailey author of “New Year’s Resolutions Guideline” suggest that you give the money to a cause you don’t like so it would feel like a punishment and make you stop. 2) Make plans around inflection points; points where the temptation to quit is strongest. This was mentioned before in this blog but I shall reiterate. In his book, ‘The Power of Habits’ Charles Duhigg writes about a study to find out the type of people who were mostly likely to fail in rehabilitation after undergoing hip or knee surgery. The participants were given a booklet with details of the rehab schedule, and blank spaces after “My goals for this week are….” They found out that patients who recovered more quickly were those who filled their booklets with plans, and their plans focused on how they would handle a specific moment of anticipated pain. The idea was also covered in Psyblog, ”Make a very specific ‘if-then’ plan.” Anticipate weak points in the plan where you could fail and make detailed plans around that. Inflection points could appear when your daily schedule is disrupted like when you travel for holidays. It’s very easy to quit new habits and relapse to old habits since it’s “Just for one month.” So it is imperative that people plan ahead. 3) Peer pressure is a very powerful force that always gets blamed for bad habits. So why don’t we use it to reinforce good habits? Let’s say your resolution is to read one book per month. You could join a monthly book club, and that commitment could push you to read. Alternatively, just have a virtual reading partner you could discuss a particular book with every months. The most important thing to remember is that breaking out of old habits is difficult. Habits form neural pathways in your brain and restructuring them is no easy feat. So if you ever fall back into your old habits, don’t beat yourself up. Instead, learn to forgive yourself. Feel free to leave your comment below and share with your friends. This entry was posted in Mind and tagged habits, psychology, self-help. In a previous post, I wrote about how it is necessary to integrate your resolutions within your life’s auto-pilot system. In this context, this system includes all the habits you’ve acquired over the years. The interesting thing is that as we grow older and shoulder more responsibilities, we forget to take a moment to upgrade this auto-pilot system. 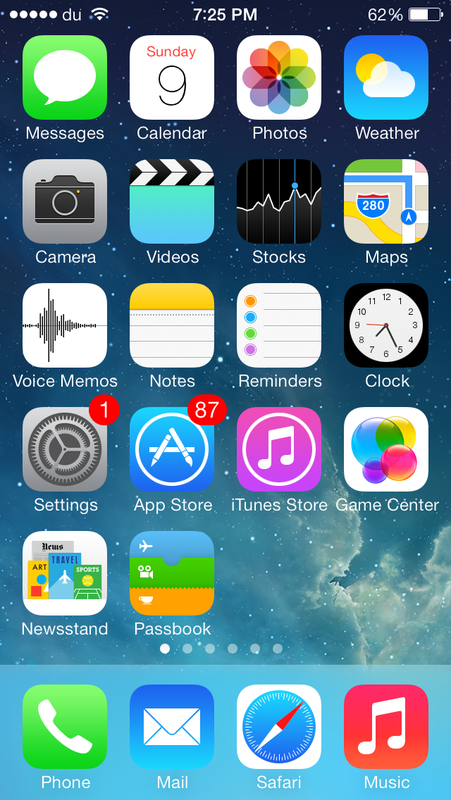 Let’s take an iphone example from my own phone. All the notifications in the photo below are because I haven’t updated the apps AND the iOS software (the solitary notification on the settings). 1) Write down your current roles and responsibilities, and list down all the habits that are connected to each role. You don’t have to do this on your own. Sometimes you can’t actually, because we tend to be blind to our habits. So it may help to work with a close family member or a friend as they can point out habits ‘we do without consciously thinking about’. 2) Dissect. When it comes to our habits, it helps to understand why some habits exist in the first place. As previously mentioned, many bad habits that are in our lives exist because we get some sort of payoff out of them. Once we assess the payoff and it becomes clear that the payoff is not worth the drawback that comes with the habit, then it would be easier to get rid of it. And sometimes we may realize that we don’t really need to get rid of it, because the payoff is actually important for us, so we can stop being guilty about it. 3) Habit replacement. 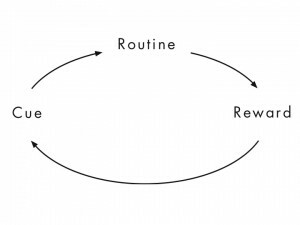 In Charles Duhigg’s book, ‘The Power of Habit’, he writes about the habit loop shown in the figure below. The habit loop is given in generic terms, and consists of the habit trigger (cue), the habit itself and the reward. So one of the methods to change a habit is to experiment with rewards, understand what drives the habit (what the true payoff is), and replace the habit with something that would result in a similar reward. Having an optimized auto-pilot system helps because it contains habits that move us forward regardless of how motivated (or not) we feel on that day. The thing to remember is to keep putting one foot in front of the other, and take a step everyday so in a month we can look back and see that we’re 30 steps ahead (or 28…depends on the month :-P). This entry was posted in Life Lessons, Mind, Personal Development and tagged habit, Life, personal development, self-help, self-improvement. Your life is made of different sections. Some of them are focused around you (your health, your mind, your career, your spirituality). Other sections include other people like your family, friends, work colleagues. Some deal with your contributions to your society. Now imagine each section is represented by a rock of different size. 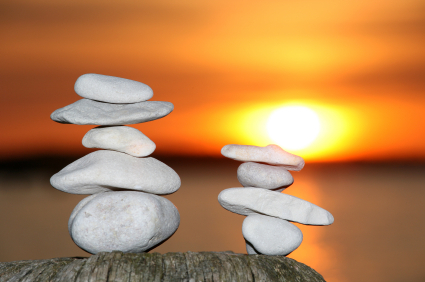 Trying to get the rocks to balance is an art that not many people master. It’s easy for one rock to fall out of place, and send your life plummeting into ruins. For example, you lose your job. It affects your attitude, and consequently your relationship with people. Maybe you become so upset that you give in to emotional overeating and eat your way slowly to obesity. And before you know it, In other words, all the rocks find themselves on the floor. So to balance the rocks, changes would need to be made. You would need to exert extra effort to keep your life in place. Don’t let the other rocks give in to gravity as they would have a tendency to do. So, think of it like this, now that you are out of a job, you have ten hours which you can invest in exploring the other sections of your life. The whole thing is to realize that you need to exert the extra effort not to have failure in one area lead to failure in others. I was watching Steve Jobs commencement speech for the umpteenth time. He spoke about how ten years after co-founding Apple he was fired from the company he co-founded. He said, “What had been the focus of my entire adult life was gone, and it was devastating. I really didn’t know what to do for a few months…But something slowly began to dawn on me — I still loved what I did. The turn of events at Apple had not changed that one bit. I had been rejected, but I was still in love. And so I decided to start over. Company or no company, title or no title, he still loved what he did and so he did what he loved. So it’s easy to feel disoriented when you wake up to a life you no longer recognize. But it’s time to go back to the drawing board and ask yourself that question, what do you love doing? This entry was posted in Mind and tagged balance, failure, Life.